Our spring weather may arrive this week. Warmer weather has an unfortunate problem. 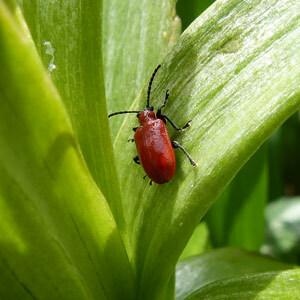 It means the dreaded lily beetle may be getting restless. What I do at this time of the year before the lilies emerge or just as they are barely emerging from the ground, is to spray “Dormant Spray” over the soil. I always add some dish detergent soap as well (acts as an emulsifier). This helps kill the hibernating adults. They emerge with the warm weather and will re-hibernate if the weather does not stay warm. So I suggest spraying a couple of times. This way you eliminate the adults in your yard. Check out all the plants they enjoy – Fritillaria is another favourite in the spring. What does a lily beetle look like? Bright red on the back, but black on the underside, so when they fall to the ground, they land on their backs and disappear.